I wake at 8.00am and go out on the balcony to catch up on the trip report. Tam stays asleep until 9.00am, which is good for her as she has been awake by 7.00am on every day of this holiday so far. 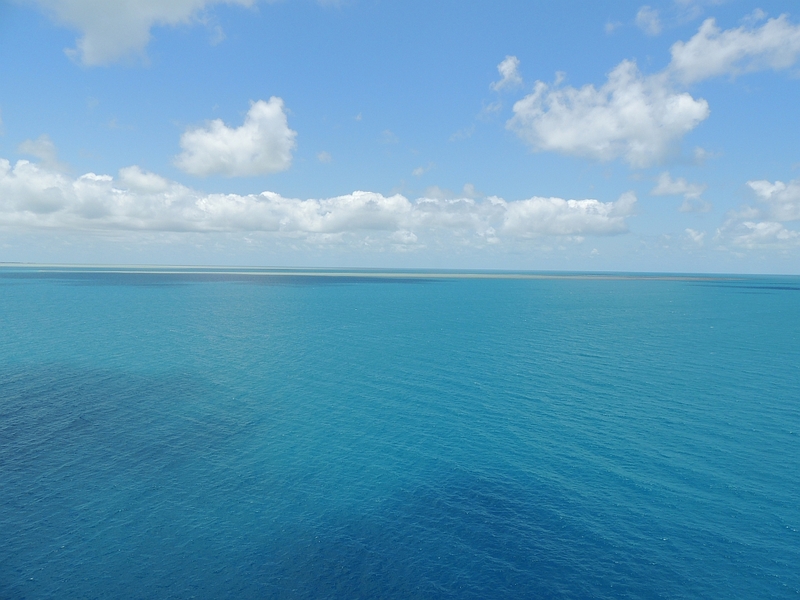 The next two days are at sea and for all of today we are travelling in the channel between the coast of Australia and the Great Barrier Reef, which gives you some idea of the vastness of this ever decreasing wonderland of nature. We have breakfast in Blu and then go to the Solstice Theatre at 10.15am for a talk by John Manka about Sea Turtles. This is incredibly informative and tells of the work of Archie Carr. Archie started investigating the reasons for the decline in the number of sea turtles before anyone knew anything about their life cycle, their habits or how they bred. His work enabled many of the conservation projects of today to help in saving this still endangered species from extinction. He has a National Wildlife Refuge in Florida named after him and Tam and I both think weve been there. One of the many things we learn at this lecture is that one species of sea turtle can dive to 1000 metres and come back to the surface without getting the bends and nobody knows why. It has been an excellent use of our time and we think we will attend a few more of these presentations in the next week. 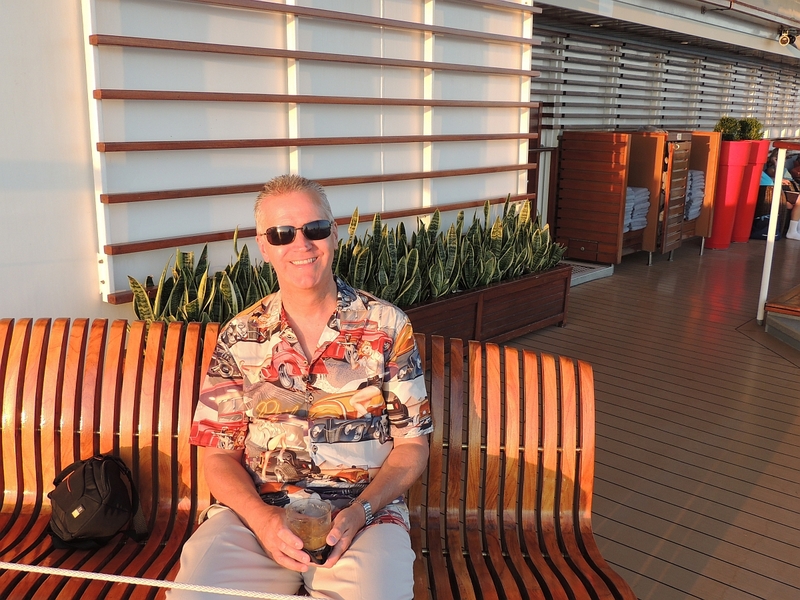 The next stop is the Solstice Deck, which is still quieter than the pool area, and we watch the scenery drift by. The sea is many different shades of blue and green and there are sand banks and small islands all along our starboard side. Its just a shame that we only got to snorkel at Airlie Beach for a few minutes, as Im sure it would have been spectacular. Its lovely and relaxing. At least it is until two young girls come and lie on the sun beds next to us. For the next hour they talk non-stop. How they find time to breath, I dont know. Theyre just chatting, nothing too loud, but by the end of the hour I have heard the word like 2,524 times  closely followed by the word literally. In fact I literally heard them talking for like an hour. Ah well, I guess its their holiday every bit as much as it is mine. 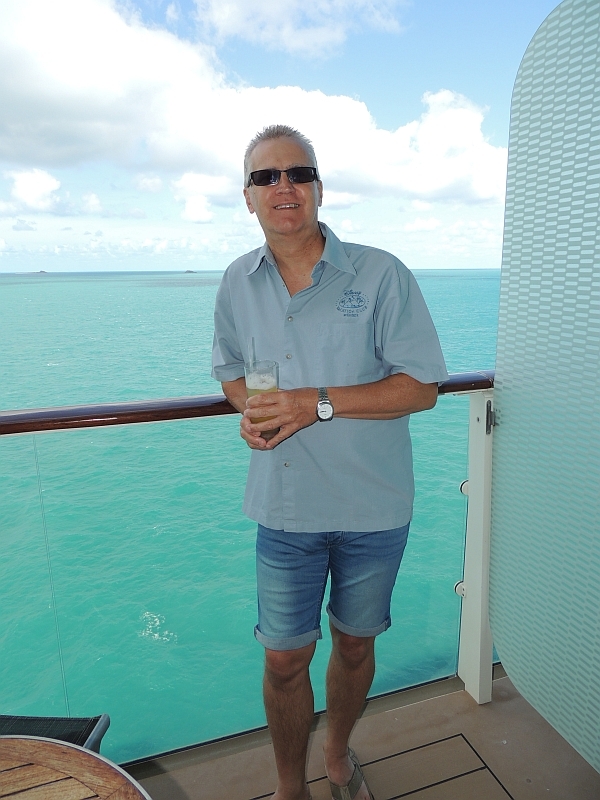 We go to the Oceanview Café for a light lunch of Caesar Salad, along with a beer before we return to our stateroom. I spend a happy few hours watching the sea and the islands from the balcony. Tam goes to a presentation on using the right posture with your pillow when sleeping, but she says that it quickly turned into a sales pitch on acupuncture. Tam suffers with a bad neck ever since the swimming debacle in Dubrovnik when she injured herself jumping into the sea. Shes now convinced that acupuncture could help. Fair enough, Ill give it a go as soon as I can lay my hands on some hatpins. 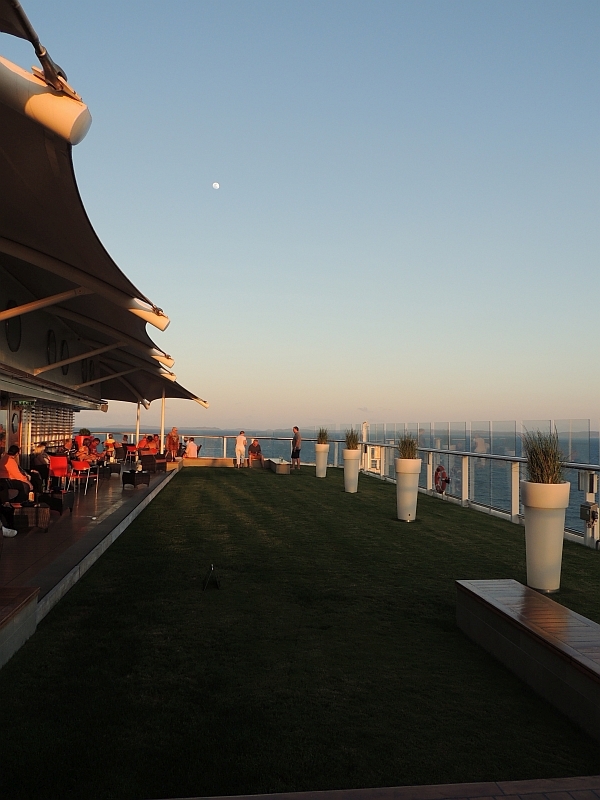 A Mojito and Whiskey Sour are sought from the Passport Bar to help our balcony sea watching. 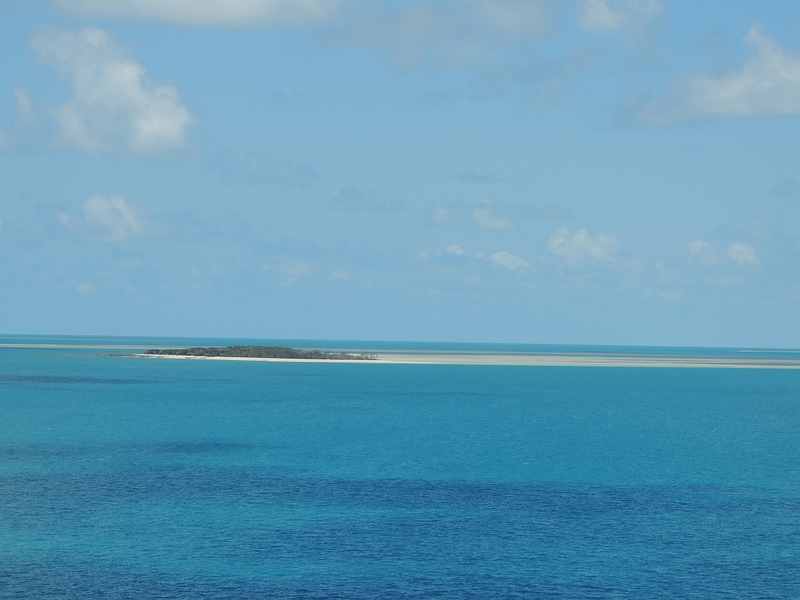 It seems we are now sailing through the Coral Sea and its a most wonderful turquoise colour. At 5.45pm we have showered and are ready for the evening and go to the World Class Bar where Loida makes us a margarita. I dont really like the margaritas at the normal bars as they make them with sweet and sour mix and theyre too sweet. Loida makes them the proper way. 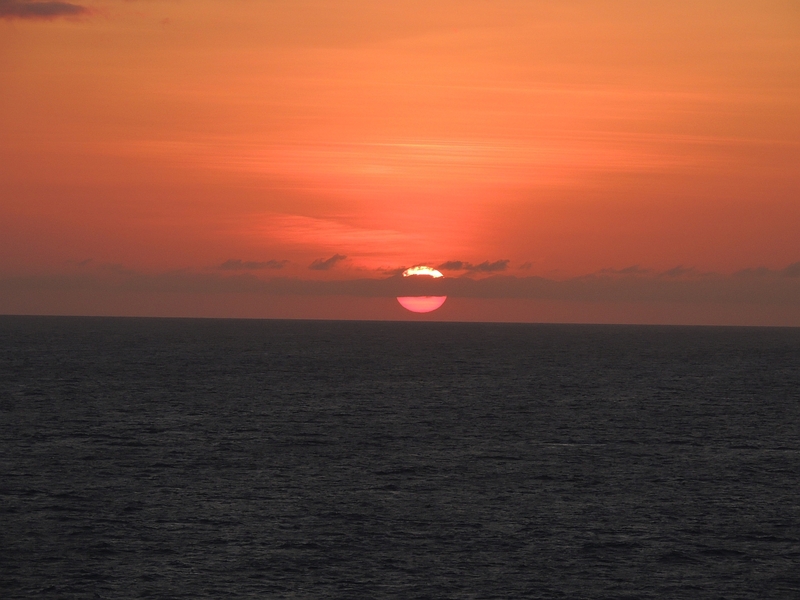 We take our drinks up to the top deck to watch the sunset. Its the first one weve been able to see, as its usually been too cloudy. Its no Captiva sunset, but its not bad at all. 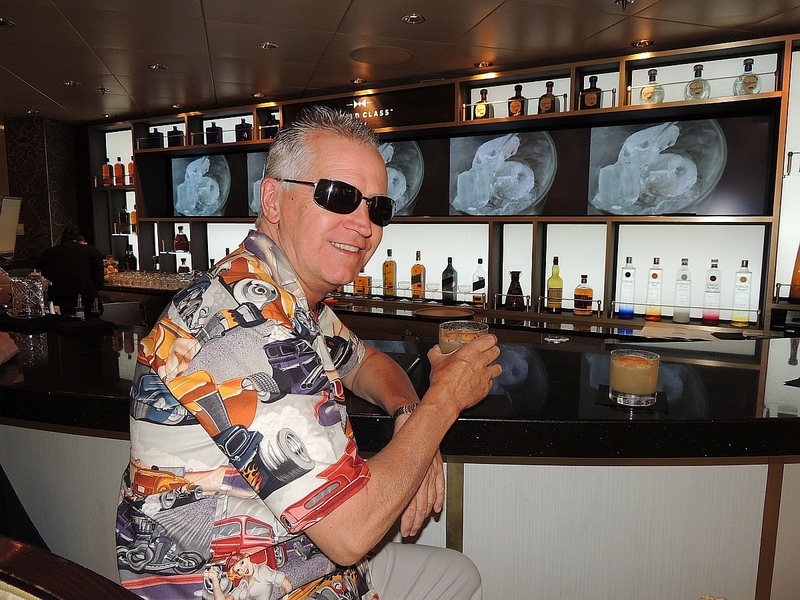 We return to the atrium of the ship where a band are playing a mixture of swing and ballroom dance music. We watch briefly before making our way to Sushi on 5. This place used to be Bistro on 5 and served paninis and crepes. The change to Sushi on 5 annoyed some and pleased others depending on whether you like sushi or not I guess. There is an additional charge for this restaurant. We are shown to our table and although its far from full, they are doing a decent trade. We order drinks of Orion Lager for me and a real ale for Tam. We start with the Chicken Gyozas we had on our first day on board, as they were so good and then share the Shrimp Tempura Roll. 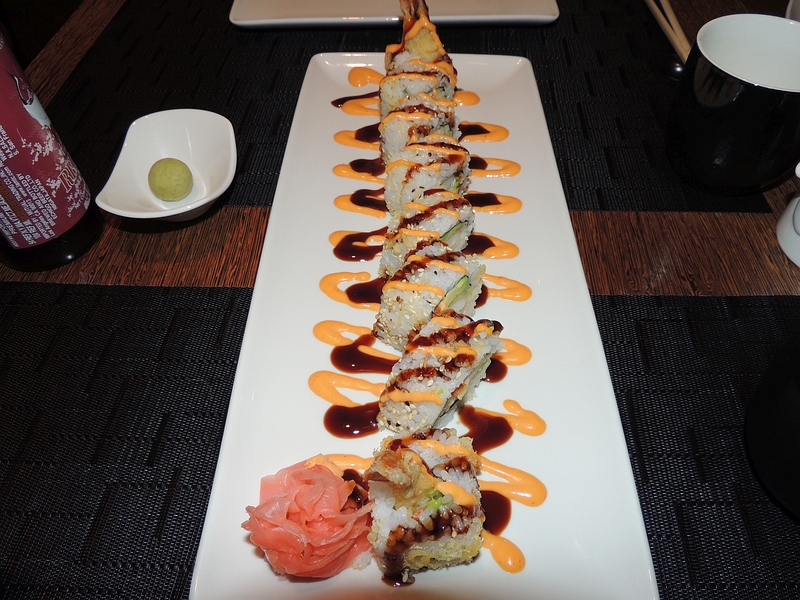 People reckon that sushi is a light meal, but Im not so sure, it always fills me up pretty quick. 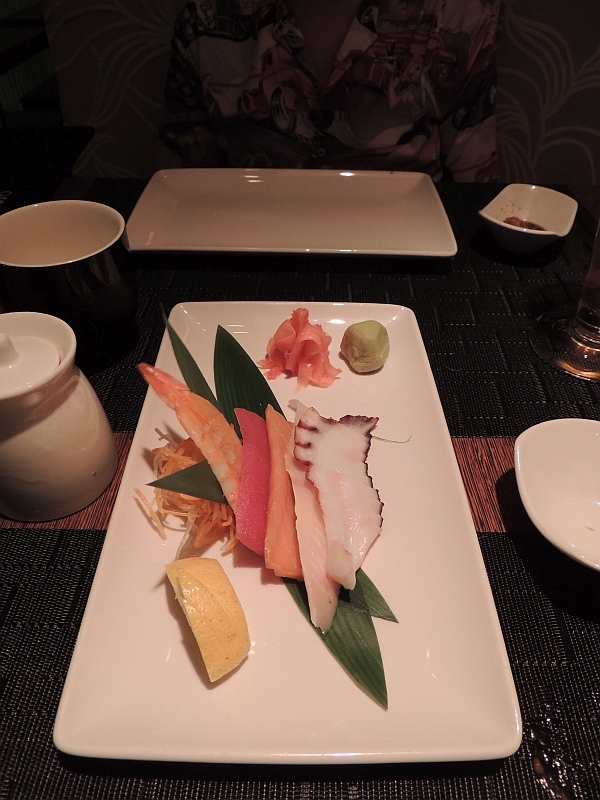 Our last shared main course is the chefs choice of sashimi. This is really just slices of raw fish of various types. They are all nice except the octopus, which is a little chewy. Still, you never know unless you try these things. We are not intending to have dessert until Tam spots the caramelised ginger cake with rice and wasabi gelato, so we split that. Its very good, although I could do without the wasabi gelato. Our total bill comes to $34 (US) and we add a $10 tip. Its a short walk across to the World Class Bar to get a drink to take to the show. Tam has a Ketel 1 (vodka and strawberries) and I just have a straight bourbon. The show this evening is a comedy hypnotist. Im completely sceptical when it comes to these things, but the show is entertaining enough as he gets volunteers to feel hot, cold, dance at inappropriate moments etc. 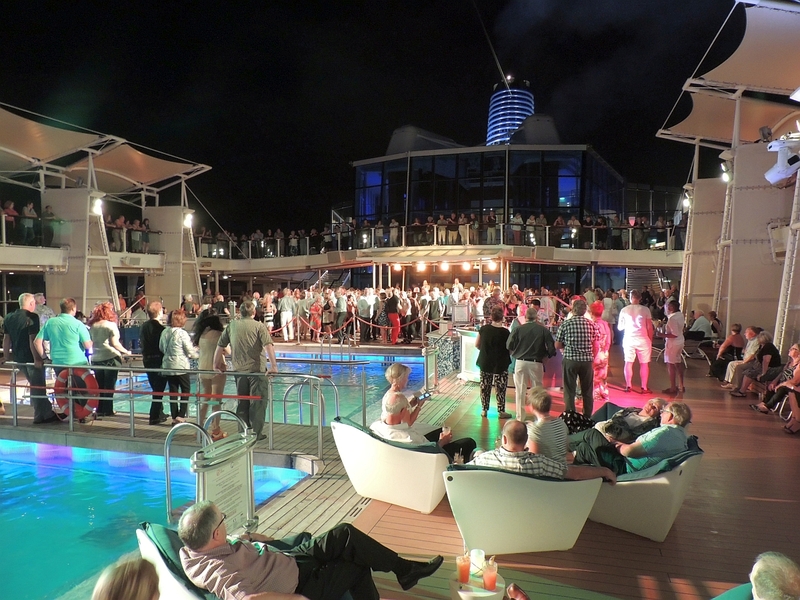 After the show everyone heads to the pool on the top deck for the Fabba deck party at 10.00pm. This witty play on words indicates its mainly an ABBA inspired evening of dancing to a band with other 60s and 70s hits (mostly Motown) thrown in for good measure. 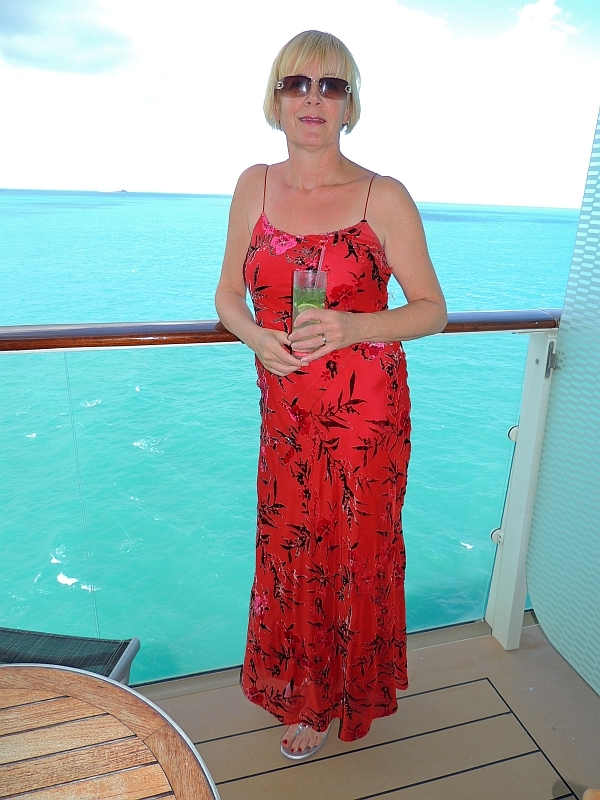 For the first time on this cruise you see how many people there are on the ship as the whole area is thronged with both the pool and promenade deck above being well utilised. I have a beer and Tam has a Pina Colada. Shes a bit disappointed when its frozen, but the copious amount of rum the bartender put in makes up for it. As the night wears on we find a double sun bed to lie on and listen to the music. 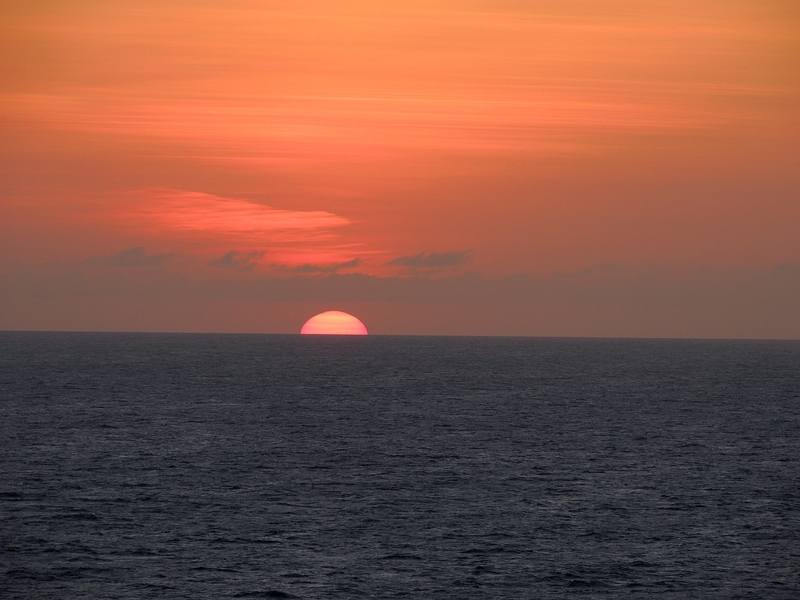 Its a lovely warm night, its still getting hotter as we sail towards our next port  Darwin. We both have a Planters Punch next as its the drink of the day, but its a bit too sweet for me and so I get a Rum and Coke instead. The crowd thins out as the night draws to a close and we are off to bed at midnight.